My obsession with Maybelline's Color Tattoos continues because today, I have two of my latest color tattoo acquisitions to share with you all. 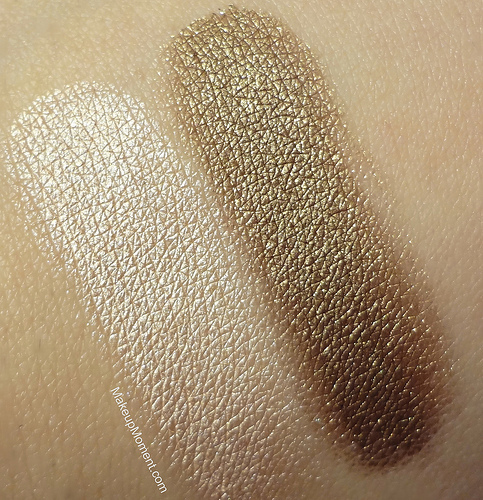 Barely Beige and Gold Shimmer were both part of Maybelline's limited edition, fall collection. My apologies for posting these up so late. But better late than never, right? Barely Beige: Semi cool frosty beige, with shimmers. Barely Beige was probably the most coveted color tattoo in the fall lineup. And with great reason, too. This color is just stunning, and so versatile. You can sport it alone on the lids for an instant wide awake, bright-eyed look. Or, you can use it as a base for your neutral eyeshadows to make them stand out more, which is what I like to do. Gold Shimmer: Medium gold, with shimmers. This is such a great shade for the colder months. The gold has an antique feel to it and it contains a lovely brown undertone, that gives the eyes a beautiful and subtle smokey appearance. The shimmers in this one are very apparent and they really stand out. I can never resist shimmer in my shadows so I surely don't mind the dazzle! 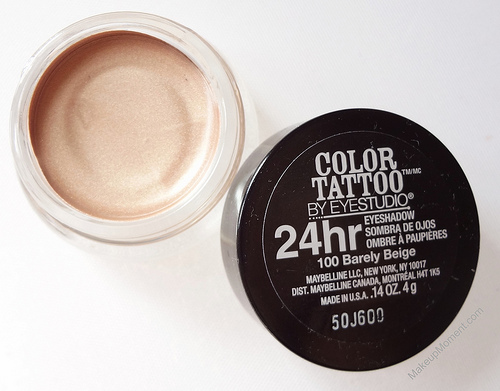 I am a huge fan of Maybelline's Color Tattoos. They are available in a fun variety of colors, and they last hours on my stubborn, oily lids (with a primer). For a cream product, an ability like that is pretty commendable, as most cream shadows start to crease on me shortly after application. These two shadows are lovely to apply. The smooth and creamy texture makes blending a breeze, and the pigmentation does not disappoint. Layering these is not troublesome at all so you can most certainly build up the color to your desire, before they set. Overall: I can't say enough great things about Barely Beige and Gold Shimmer. The creamy texture, the rich colors/finish, and the awesome lasting power, all make for a winning product in my book. I think both of these color tattoos are amazing and I really wish that they would have been part of the permanent range-especially barely beige, which I have been sporting loads since I first got it. It has since become a staple that I can't be without. 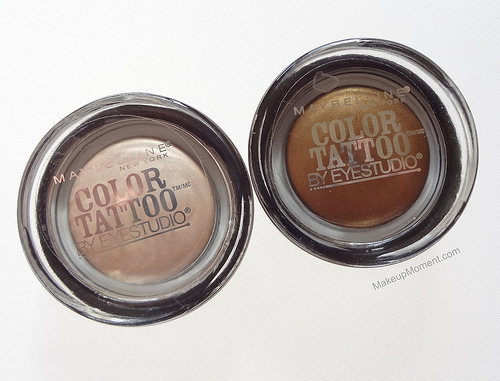 What do you all think of Maybelline's Color Tattoos in Barely Beige and Gold Shimmer? 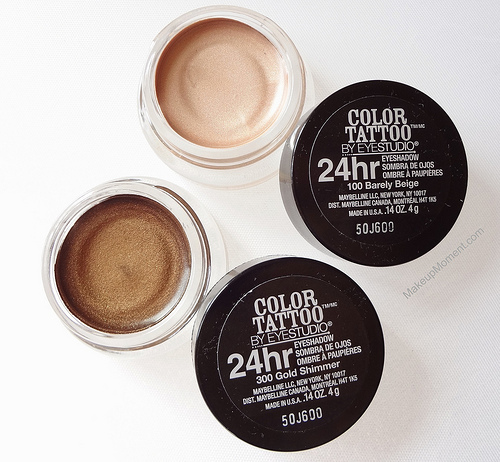 Which are your favorite Maybelline Color Tattoos? I wasn't too enthused to get Barely Beige, but I do rly want Gold Shimmer! I love Gold Shimmer! 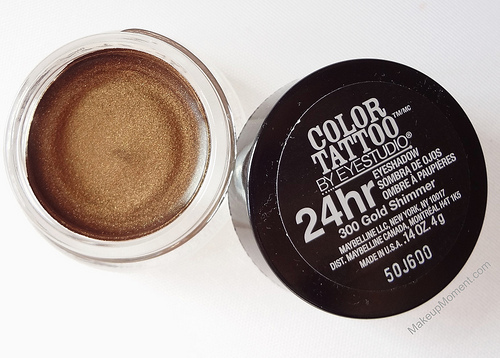 It's amazing for creating a smokey eye with :) Have you tried other Color Tattoos from Maybelline? Which are your favorites? i would really like to get barely beige but i cant seem to find it anywhere! love it! It was such a mission to find barely beige, Niki! I checked loads of drugstores before finally getting my hands on the last one they had on display, at a Duane Reade store, LOL! The hunt was worth it though because I really do love the shade :) I hope you find it, hun! I really want Barely Beige but I'm sadly on a no-buy :( It looks sooooo pretty, though! Both are great I have Barely Beige but Im still looking for the other one. Thanks, Jazmin! I am glad you have barely beige :) And I hope you can get your hands on gold shimmer, which is just as nice of a shade! I have Gold Shimmer and it's a lovely shade, though a touch too dark for everyday wear for me. Love Barely Beige - never managed to track that one down, though wish I did! It was such a mission for me to find it! LOL!